Stylish window treatments at affordable prices. Book your free measure & quote! Our blind technicians come to your house in every Adelaide suburb. Because we make your blinds in our factory, we’re able to keep our overheads down and save you money by cutting out the middleman. Your security doors and screens are also manufactured by us and you can rest assured we use the best security components available. Call today for one of our mobile blind technicians to visit & provide a free measure and quote for your blinds. I just wanted to let you know that our blind looks fantastic! The installer was professional and took his time to ensure that a proper install was made. Mum and I would like to thank you for a wonderful service, everything from start to finish was a delight!. I keep coming back to The Blind Man! I’ve had awnings, veranda blinds and Crimsafe security screens supplied and installed by The Blind Man. Every area of the process with them is reliable and easy to deal with, ranging from quote booking, conducting the quote and installation. What a great team you all seem to be and a fabulous product you provide. Thank you. I just wanted to say thank you for your assistance in ordering the Plantation Shutters for our new house at Hallett Cove. We are very pleased with the result and would recommend you to our friends, as your pricing and professionalism were outstanding. You save on Blinds as we are factory direct. Take the hassle out of shopping for blinds. We come to you! Call us on 8374 4195 to book a measure and quote at home our consultants will provide all you need to know to make an the right choice. 0r You are invited to view our latest samples and talk to our helpful staff at our showroom. NOW is the time to get ready for autumn and save. Purchase the latest blind styles and save. Book an appointment with us before the end of the month to qualify for real savings on shutters, awnings and a wide range of indoor blinds. Note to House Owners and Houseproud family members: when we install your new blinds, shutters or awnings, inside or outdoors, any mess we make we will take away with us leaving your home at least as neat as when we arrived. This is our life and our passion, we have been selling, making and installing blinds for Adelaide homes and families for 30 years. Innovation in design and technology. Our range of colours, styles and construction materials is 2nd to none. You get a wider choice than we have ever offered. You get the best brands Australia has to offer and also all our custom designed and constructed window dressings are made right here in Adelaide. Our range of outdoor blinds, roller blinds, awnings, Holland blinds and slim, micro and traditional timber Venetians means you will find the sun and weather protection that you are looking for right here at the Blind Man. We are a local Adelaide and South Australian business. 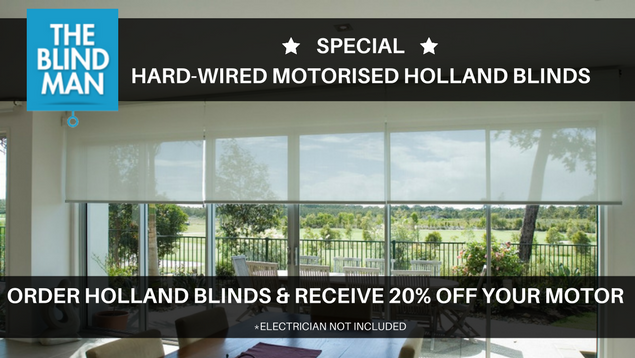 We know all about the latest blind designs and the most stylish blinds featuring in the Australian marketplace. But our roots remain in Adelaide so we are very much aware of the factors affecting local installation of blinds – especially outdoor blinds. We will come and visit you to talk about the options for your interior blinds or your exterior shutters and awnings. We offer a free measure and quote, obligation free. If your current blinds or shutters are in need of repair then we can give you a fair price to have them fixed by our installation team. Call us on (08) 8374 4195 for a no obligation, free measure and quote. We will custom make your new blinds. This way we can guarantee a perfect fit everytime, especially for non-standard window sizes. The Blind Man Manufacturing Centre uses quality materials and technology. Make a selection based on exactly what you have in mind. Your first choice will be the style of blind, then you can consider the construction materials and colours and designs. We will help you with your decision with friendly, practical advice and give you clear information about prices. You will be choosing from amongst the most stylish indoor blinds or outdoor blinds available in Adelaide today, you can rely on us to build your blind made to measure or have a shade or awning made to meet your special needs. We also offer a range of blinds made by our partners, these premium blinds are made to measure for you. When you have made your selection for your outdoor or indoor blind, shutter or awning we will come and expertly install it for you. Our installers have seen and overcome every possible installation problem, so we are ready for you. We also install and supply premium security screens and security doors. Built to the highest standards, and built to last and keep you and your family safe . The Blind Man makes a range of fly screens to keep the flies and bugs out of your home. Our range of interior blinds has been expanded to include the latest range of plantation shutters and Dutch awnings as well as automatic awnings.